Chance The Rapper, The Killers, Major Lazer, Odesza and The Roots will headline the first-ever Lost Lake Festival at Steele Indian School Park in Phoenix over the weekend. Superfly, the co-producers of Outside Lands in San Francisco and Bonnaroo in Manchester, Tenn., is putting on the three-day festival focused on music, art, games, and food. Lost Lake Fest will be Oct. 20-22, 2017 at Steele Indian School Park in central Phoenix. The park is near Central Avenue and Indian School Road. Friday, Oct. 20: 2 p.m. - 11 p.m.
Saturday, Oct. 21: 12:30 p.m. - 11:30 p.m.
Sunday, Oct. 22: 12:30 p.m. - 10:30 p.m.
Lost Lake is considered to be an "all ages" event. Children under 10 do not need tickets to attend. VIP passes include fast-track entrances and exits, designated viewing areas at the concerts, access to VIP hospitality areas and additional food and drink options. Tickets are still available . Steele Indian School Park is near Central Avenue and Indian School Road. The address is 300 E. Indian School Road, but it is important to note that festivalgoers will not be able to park at the venue -- there is no parking available. Parking within the nearby neighborhoods is also off limits. Law enforcement will be monitoring neighborhoods for illegal parking, according to City of Phoenix website. You can report illegal parking via a special hotline, 602-288-9589. Valley Metro light rail & Park and Ride: There are 11 park-and-ride lots throughout the Valley. People can park at each lot for free and then take the train to the festival. If you have a Lost Lake ticket, you do not need to buy a light rail pass. Your ticket is your light rail pass. If not, regular fare is $4 roundtrip. The main location will be at urban garden Agave Farms -- 4300 N. Central Avenue -- near Central and Glenrosa avenues. A secondary location will be Second Avenue between Indian School Road and Indianola Avenue. Bike valet: For those close enough to ride their bikes to Steele Indian School Park, there will be a place to store it. The festival will have free bike valet. Fee-based shuttle: Plus One, a private shuttle company, will have shuttle services to and from the festival grounds. The cost is $30, plus fees, per person. View schedule . In light of the tragedy at a country music festival in Las Vegas, officials and police are paying special attention to security ahead of Lost Lake. Festivalgoers should expect to go through metal detectors, pat-downs and have their bags searched before entering the festival grounds. Items allowed into the festival: Blankets, 12-pack-sized coolers, empty hydration backpacks, and two-liter-sized sealed water bottles. Items not allowed into the festival: Weapons, drugs, chairs, selfie sticks, cans (of any kind), skateboards, scooters, fireworks. Officials are also asking attendees to follow the "see something, say something" rule. If you see something strange, let security officials know, or call 911. As with any festival, Lost Lake will not have a shortage of music to listen to, food to eat, drinks to enjoy or artists to watch create. Looking for the stage lineup? Scroll down just a bit. Lost Lake Festival also has an app with festival details. Download app . The Lost Playground: This area will have various oversized backyard-style games, including a 56-foot billiards table that uses bowling balls vs. regular pool balls. Other games include LED-lighted table tennis and lighted Twister. Phoenix Flavors: Twenty of Phoenix's top chefs and restaurants, curated by Chris Bianco of Pizzeria Bianco, will be serving up various dishes. Brewpark: This area will have a variety of local craft breweries, including Phoenix Ale Brewery, SanTan Brewery, and Huss Brewing Co. The Lava Pit: This area is all about barbecue. Nectar of the Gods: If you enjoy Tequila, Reposado or Mezcal, this is a section of the park that you will not want to miss. Silly Slope: This area is for the little ones. Partnered with the Children's Museum of Phoenix, kids will be able to create their own musical instruments, hats and wristbands. Each night after the festival ends, performances will continue at Crescent Ballroom. These events require a separate ticket. More information . Oct. 20 - Kongos, Young Mothers, Treasure Fruit. Show starts at 11:15 p.m. Tickets are $25, plus fees. Oct. 21 - Lil Jon and M'Rocka. Show starts at 11:15 p.m. Tickets are $40, plus fees. Oct. 22 - Diplo and Trackstar the DJ. Show starts at 10:30 p.m. Tickets are $25, plus fees. 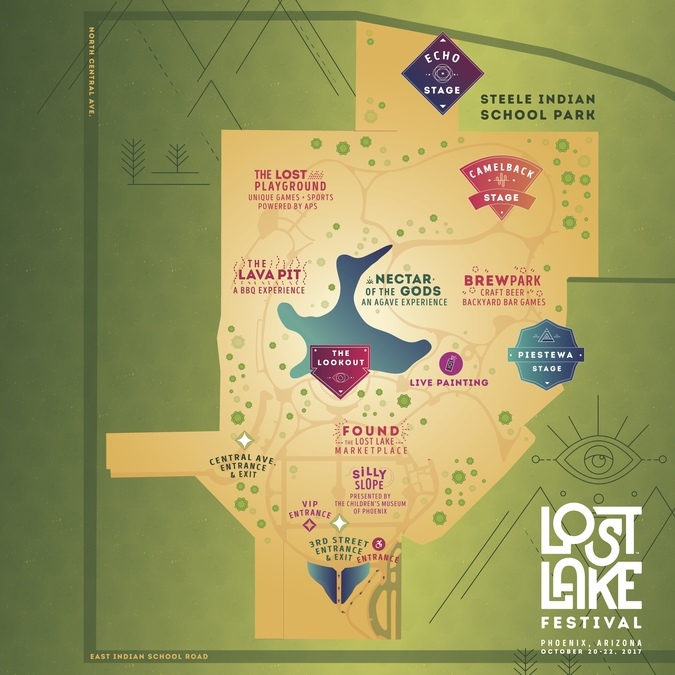 Visit www.LostLakeFestival.com for more information. Editor's note: This article has been updated to reflect changes to Lyft's pick-up and drop-off locations.